This, ladies and gentlemen, is Saffron Ice Cream. This sweet treat is decadent, addictive and exotic. Plus, it's perfect for summer! This is 1 gram of the good stuff. I used the whole thing in this recipe, but it's not necessary to use this amount. The flavor may be overwhelming if you are new to this costly spice and even veterans might like just a hint of its flavor, in that case use half or quarter of this amount. It is very expensive so even a few strands will give you a faint yellow color and hint of fragrance, no need to go crazy with it. Also, my favorite cheat is buying Saffron Liquid. I found it at my local Middle Eastern market and I found it online too. You get way more bang for your buck that way. It's my secret ingredient in my Lady Sansa cocktail (one of 10 Game of Thrones themed cocktails I made. I'm currently suffering from end-of-the-season withdrawals. Boooo..). It's also the star of my Saffron Popcorn, if you like butter on your popcorn you have to try this popcorn. You need to scald the dairy mixture (measurements in the recipe card at the end of the post), or heat it until it is barely at a simmer. While the dairy mixture heats, make your "liquid luxury." Set the nectar of the gods aside and then check on your dairy, making sure it doesn't bubble over. Once it's heated, turn off the heat and let it cool down. In the meantime, grab 6 eggs and a cup of sugar. Separate the yolks from the whites. My favorite way to separate eggs is to just crack open the egg and toss the yolk back and forth between each half of the shells and the whites will just fall off. 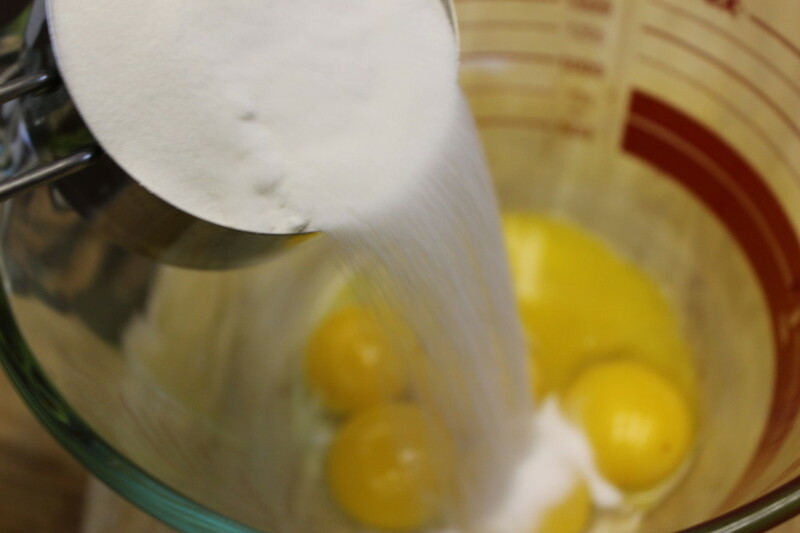 Whisk together the eggs yolks and sugar until they are pale yellow and silky smooth. You want it to be just thick enough to coat the back of a spoon and hold its shape when you make a line with your finger. Strain the mixture, chill it overnight and then freeze it according to your machine's instructions. Try to have the patience not to eat this right out of the bowl and transfer it to an airtight freezer-safe container and freeze for a few hours or overnight until it sets. Then scoop some and enjoy! 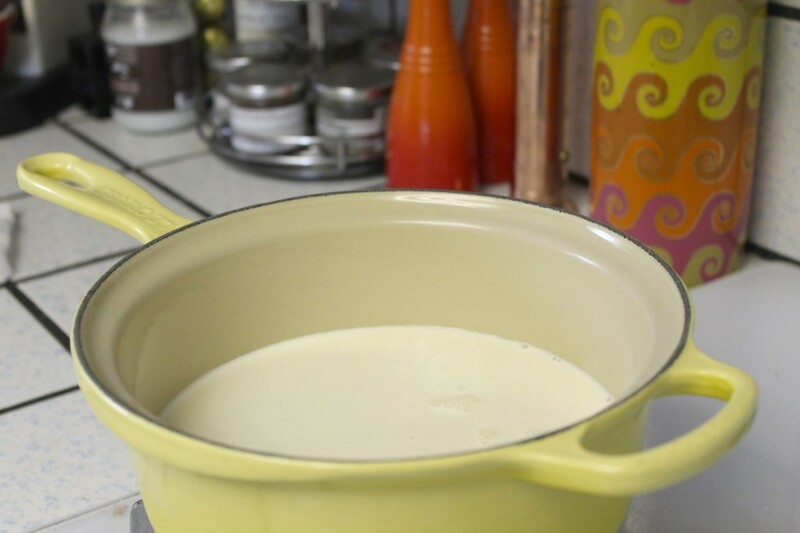 Begin by heating the heavy cream and milk together in a pot until it's beginning to simmer, then remove it from the heat. While the dairy heats, place the saffron in a small bowl and crush it with the back of a spoon until it resembles a powder then add the hot water over it and allow it to steep. In a separate bowl whisk the sugar and egg yolks together until they are combined, silky smooth and pale yellow. Once the dairy has heated, allow it to cool for a few minutes, and then SLOWLY add in about 2 cups of the heated dairy to the sugar and egg mixture while whisking. Once you have whisked in about 2 cups of the dairy, add the egg, sugar and dairy mix back to the pot with the dairy and mix until well combined. Add the saffron liquid and vanilla extract to the mixture and turn on the heat to medium/low. While on the heat, continuously stir the mixture until it is thick enough to coat the back of a spoon. You should be able to make a line across the back of a spoon coated with the mixture, and the line should hold it's shape (refer to photos in my post above). Once the mixture has thickened, transfer it to a bowl and refrigerate overnight. Once the ice cream mixture has chilled, freeze it according to your ice cream maker's instructions and transfer to an airtight container and then place in the freezer to set.